Lucien Guest, 16, from Houghton le Spring, has been a trumpeter in the Young Musicians Programme since 2013. He plays in Young Sinfonia (youth orchestra) and Jambone. “Playing in a band this size is great experience as everybody gets a chance to play a solo and you can hear all the different instruments. Being in Jambone has been a great way to make new friends. Everyone gets on so well and this comes through the music when we play. “I’ve got to play in a lot of different venues and at big events. 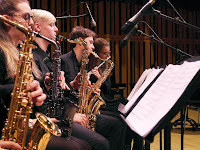 The Jazz Festival at Sage Gateshead is brilliant! Wendy Smith, Director of Creative Learning at Sage Gateshead, said: “We aim to bring music in all its forms to people of all ages and walks of life, regardless of background or circumstances. “This funding will allow a greater variety of musicians of all ages and abilities to access jazz through our ensembles and enable them to learn and grow as individuals and musicians, as well as offering them the opportunity to progress to further levels of study. Sage Gateshead is an international music centre and renowned conference and event venue located in the North East of England. It is for artists, for audiences, for the North and for the long term. Its concert programme incorporates all kinds of local, regional and international music and runs all year round. Music-making and learning activity takes place not only in the building but across the region. Ronnie Scott’s Charitable Foundation (registered charity no: 1163990) is a non-profit organisation dedicated to the support of jazz education in the United Kingdom, and beyond. Launched in December 2015, it aims to ensure that music education is accessible to every child and young person, especially those who are under-privileged, by raising and distributing funds and gifting musical instruments to organisations that create or develop youth jazz programmes. Since its creation, it has supported over 20 projects in the UK benefitting over 1000 school children. One of its fundamental aims is to inspire more young people to become the next generation of musicians.